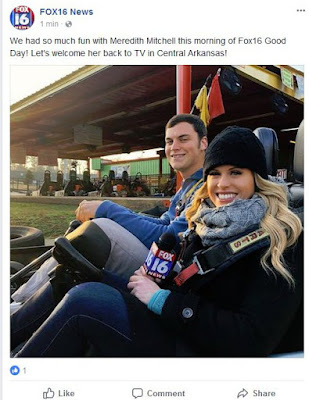 Former KTHV/Channel 11 weather anchor/reporter Meredith Mitchell is back on the air in Little Rock. Mitchell is now working for KLRT/Channel 16-KARK/Channel 4. Mitchell disappeared from KTHV in late 2017 with no explanation. As she would say, she is still in "Arkanthaw!" Actually 16 is a step up from thv. Was there a 30 or 60 day no compete clause that had to be fulfilled before Meredith could go to work for Fox 16/Channel 4? Yay, my monkey girl is back!!!! She should win the babe bracket. Against who? Craig O Neil and Liz? Does anyone know why she was let go from 11? Or did she leave on her own? Let go I am betting, they have been cleaning house. Look at how many have left in the last year alone. If they would get rid of Dawn and Craig that would be even better. Arkanthaw, Arkanthaw you run deeeeep in meeeeeeee. I miss Liz she was my favorite. Oh god please don't bring back Liz. Janelle is married. And Beth Hunt is expecting another baby. She was rarely seen on thv also, for a reason. Apparently all yall with the negative comments are perfect specimens of the human form and have a superior command of the English language. If Meredith is that bad, maybe all yall should get on the TeeVee and show us ignernt commoners how it's done. From what I've seen in my 25 years in Arkansaw all yall could use a few trips to the dentist so I wouldn't have to look at those rotten gaps in yore smiles and maybe you could go to one of those Babtist churches that are so plentiful and learn a little about treating your fellow man with love and compassion. I commend her for getting out there and doing what she does. It takes guts unlike people that run others down like you gutless internet trolls. @3:29 PM, try KARK 4 Today (NBC, 5-7 am M-F) and KLRT 16 Good Day (FOX, 7-9 am M-F). Meredith does some on-air reporting now during the morning shows there. Its Habib from Quickie Mart posting again. Hey Metwaly, did Youtube cut your funding too? Bummer! Don't go postal now. It'll be alright. I’m glad to see the hyperactive young lady on the air again. Plus, She’s not hard to look at. Someone mentioned the ch 16 weather girl in another post, so forgive the post jump here but I think the 16 girl is possibly the homeliest tv person I’ve ever seen.